Sally Field. Lindsay Crouse. Ed Harris. Amy Madigan. John Malkovich. Danny Glover. Drama. 1930s. Weepie / Tear Jerker. Family Viewing. Historical. Oscar (Best Female Lead). Toronto Festival Best Film. Recommended. 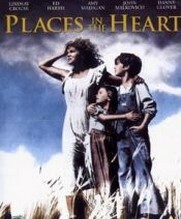 Two Oscars were awarded for this stirring tale of a young widow trying to run a cotton farm through the Great Depression with the help of family and a disparate group of friends. Superb.